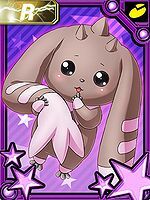 Difference between revisions of "Lopmon"
An extremely precious twin Digimon Child. 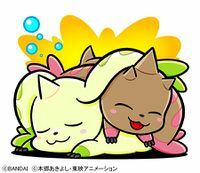 Terriermon is the one with one horn growing from its head, while Lopmon is the one with three horns growing from its head. 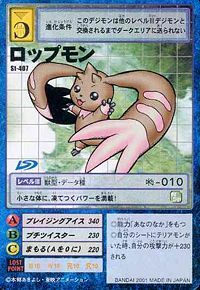 The way it grows is shrouded in mystery, and though it can be classified as a Beast-species Digimon from its body structure, aside from that it is still not understood. 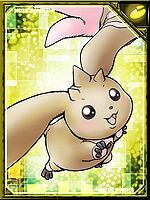 Terriermon has a calm personality, but is very robust. 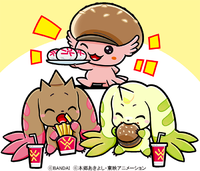 In contrast, Lopmon has the personality of a lonely crybaby. Neither of them seem like "Combat Species" Digimon, but when battling, they show that they are more powerful than they appear. 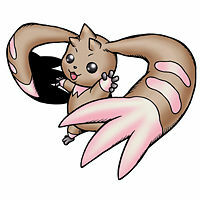 Its Signature Moves are generating a tiny tornado by spinning its ears like a propeller (Petit Twister), and its Unison Technique "Double Typhoon". Its Special Move is spitting out shots of supercooled air (Blazing Ice). 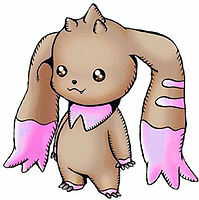 Child level, Data attribute, Beast type Digimon. Its Special Move is Blazing Ice. 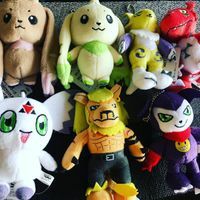 — Digimon Tamers: "Where's Terriermon! 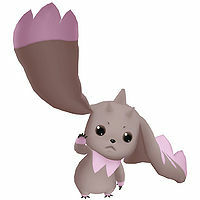 Shaochung goes to the Digital World"
n., A breed of rabbit, characterised by their distinctive floppy ears. 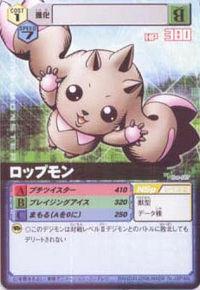 プチツイスター Puchi Tsuisutā Tiny Twister/Lopnado Causes a tiny tornado by spinning its ears like propellers. ブレイジングアイス Bureizingu Aisu Blazing Ice/Blazing Fire/Imploding Ice Fires shots of super-cool air from its mouth. Uses Blazing Ice in midair. Slaps the enemy with one of its ears. Repeatedly slaps the enemy with its ears. Windmills its ears in midair to slap repeatedly. 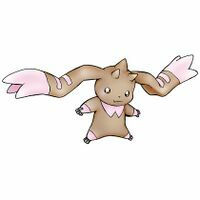 Spreads its ears, enabling it to fall or glide slowly. Spins along the ground, slapping the foe. A powerful unison technique with Terriermon. 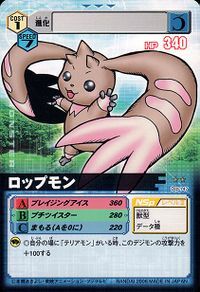 Lopmon is the partner of Wallace and twin brother of Terriermon. 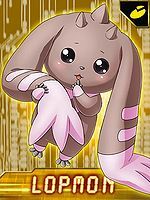 Lopmon is the Digimon partner of Lee Shaochung. 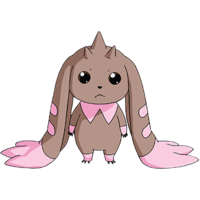 After Cherubimon is defeated, he is reborn as Lopmon. 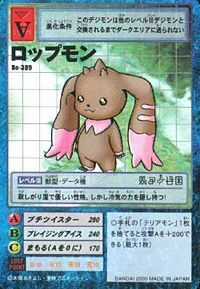 Lopmon is a hidden character. 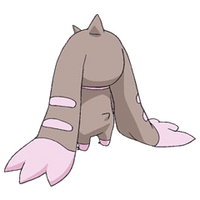 He can evolve to Cherubimon (Evil). 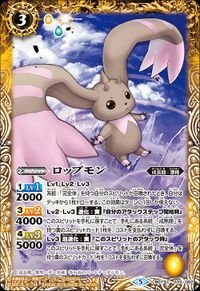 Can evolve from Pagumon if above level 10 and Stress above 90%, or can be found at Mushi Mushi Jungle. 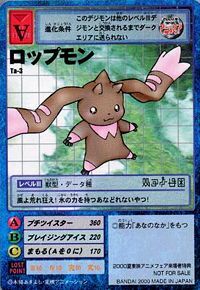 It can evolve to Wizarmon if above level 16. It also gives you an Onegai Quest to obtain an Inari-sushi from Renamon at the DigiCentral's Tamer Office entrance. 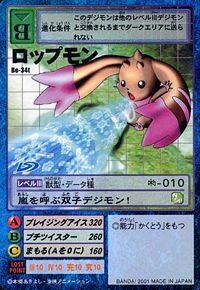 Lopmon is only obtainable as a collectible card. 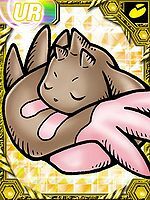 Its card is part of the Sorrowful Fallen Angel (哀しき堕天使 Kanashiki Daten Shi) set. 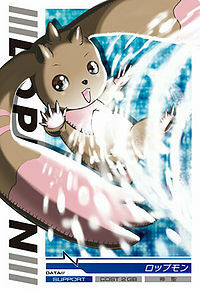 Lopmon is the partner of Tsukimori Chihiro. 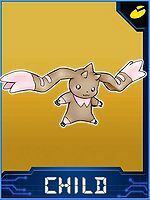 Lopmon is an enemy Digimon in Area 2. 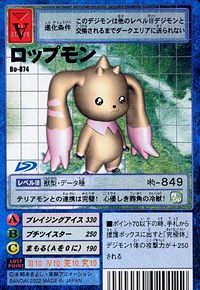 Lopmon is an enemy Digimon in Secret A.
Lopmon is an enemy Digimon. Its small body is filled to the brim with freezing power! It has a lonely but kind personality. However, it hides its icy powers up its sleeve! Its coordination with Terriermon is perfect! A kind-hearted, three-horned freezing beast! 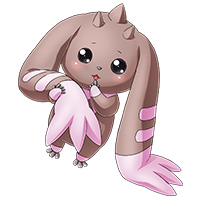 A twin Digimon that calls upon storms! Let the winds rage! Bearing the power of ice, this is one Digimon you cannot bring yourself to hate! 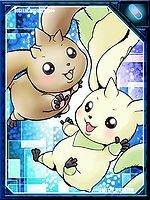 A rare Digimon that is born as twins together with Terriermon. 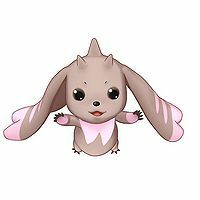 It has grown three horns, and while it is a Combat Species Digimon just like Terriermon, it exhibits a lonely and crybaby personality that is the exact opposite of Terriermon's. 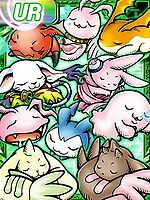 (Special Illustration by Watanabe Kenji) Illustration for the Digimon Web Official Twitter Illustration for the Digimon Web Official Twitter Illustration for the Battle Spirits Collaboration Booster: Digimon - Settle it! Card Slash! 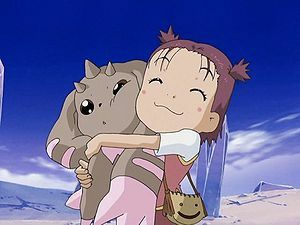 ↑ 19.0 19.1 Digimon Xros Wars: "Don't Die, Greymon! The Birth of Shoutmon DX"